"One woman's simple, three-step guide to surviving a night on your own." A must watch short film straight from the SXSW Film Festival earlier this month. How To Be Alone is the first short film directed by writer Kate Trefry, who works as a staff writer for Netflix's "Stranger Things" and co-wrote the other short Souls of Totality. 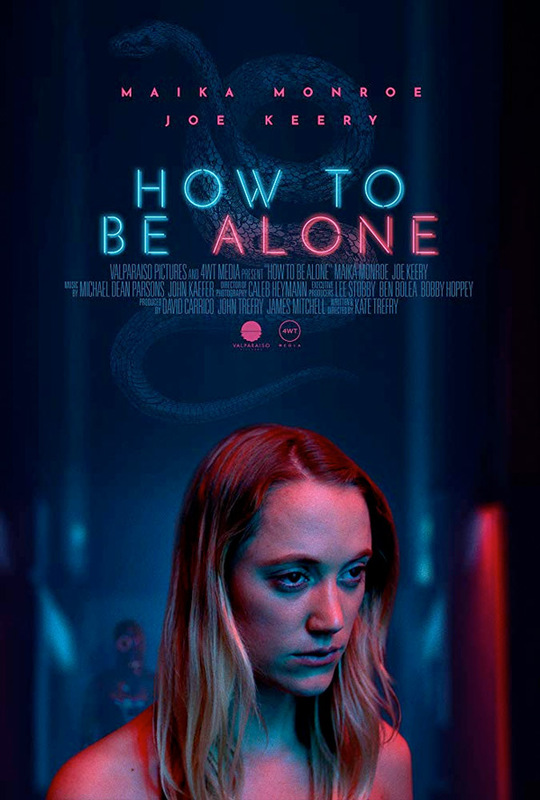 How To Be Alone stars actress-on-the-rise Maika Monroe as a woman who has to survive the night when her husband, played by Joe Keery from "Stranger Things", leaves to go work the late shift. "It isn't particularly scary per se, though it is a gorgeous film filled with incredibly creepy imagery, but instead it shines as a thoughtful character examination of a young woman in a crisis of identity." This one hell of a short, so much ingenuity and so much in her mind, wrapped around a cool concept for a short. Check it out. Thanks to Short of the Week for the tip on this. Original description from YouTube: "This dark and wickedly fun short film stars Maika Monroe (It Follows, The Guest) as a woman whose deepest fears seem to manifest physically when her husband, played by Joe Keery (Stranger Things), leaves for the night shift." How To Be Alone is the first short film written and directed by Kate Trefry - follow her @KaaaaaateTrefry. Trefry co-wrote the short Souls of Totality and has been working as a writer for Netflix's "Stranger Things". Produced by David Carrico, John Trefry, James Mitchell. Featuring cinematography by Caleb Heymann, and original music composed by Michael Dean Parsons and John Kaefer. This just premiered at the SXSW Film Festival earlier this month. For more info, visit SOTW or the official website. For more shorts, click here. Thoughts?